The Soil is searching for new local talent across South Africa . One of the Soil’s recent Instagram post was a video announcing that the acapella group will be looking for new local talent in each city that they are set to perform during their nationwide tour. The act chosen will not only be the opening act for the “Inkwenkwezi” singers and perform on stage with them but also get the opportunity to collaborate on one song. 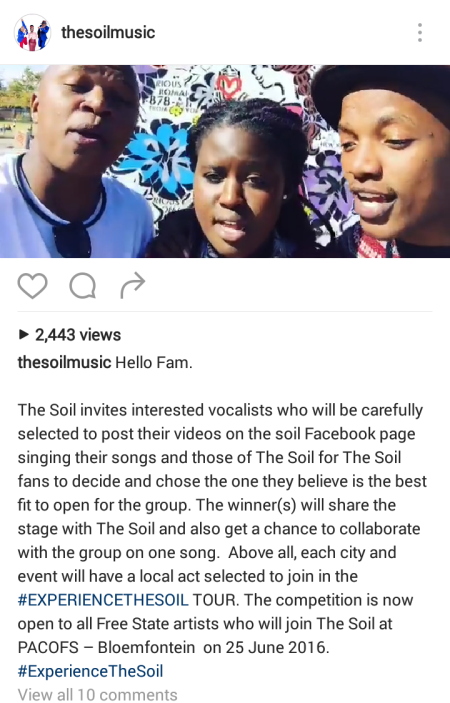 Aspiring vocalist are encouraged to upload a video of themselves singing (original songs or songs of the soil) on the Soil’s Facebook page. From there on, the Soil fans will be able to vote on who they think deserve to be on stage with the award winning acepella group in the city they set to perform in. The talent competition kicks off a Free state, artist are now able to enter the competion and chose who will join The Soil at PACOFS – Bloemfontein on 25 June 2016.